For those of you looking to read a post about free SEO advice and site design, this is not going to be one. About one hour ago I was bidding on a sizable Elance.com job. I noticed another contractor was waist-deep trying to nab the same project. He looked good. Had a great profile picture. What he offered was ideal for the client. Then I saw the one thing that drives me bonkers. A Lie. I was half-tempted to screenshot his #1 ranking client for this post. Then I thought about what my parents taught me years ago. Be nice. So I will be nice but also honest to boot. What is Exact Search Traffic? He helped a Louisville, Kentucky mortgage broker rank on the first page of Google. Granted, he was honest not claiming a #1 position. However, he did what completely drives me insane. His bait to trick you into hiring him is about as old as dirt. Listen, you’re going to hire someone. If it is him, I wish you the best. But whomever you hire, you had better be damn sure you know what you’re hiring. Will it be apples to apples? Real SEO value for real searched keywords? He claimed to have helped the broker rank #5 on Google for the keyword phrase ‘louisville kentucky mortgage broker’. Sounds reasonable right? Oopsies as my young kids say when they make a mistake. The problem? Hmmm… It’s larger than a big, fat problem. It’s ginormous as my oldest daughter often loves to say. His bait is anyone who reads his case study thinks he’s pretty good. Come on, a first page ranking on Google? The better question is how many people are searching Google for his client keyword phrase per month? The honest answer? 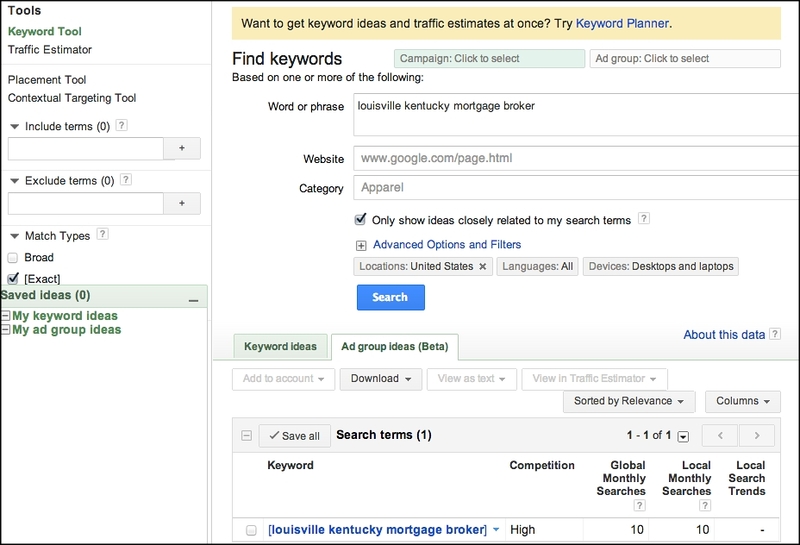 Exact is the exact keyword phrases people are searching according to Google search data. End of story. Let me ask you a question. Would you be as mad as hell if you paid an SEO guy to rank you for a keyword with 10 searches a month?